Review: The worldwide success of the Twilight franchise inspired quite a lot of similarly themed young adult novels to emerge and it was only a matter of time before a studio snapped up the movie rights in hopes of creating their own money-making cash cow. Warner Brothers had a very profitable run with the Harry Potter series but hasn’t found a true successor to the boy wizard. With Beautiful Creatures, they may have a shot if audiences respond well to the film with its campy moments, solid acting, and decent narrative. Instead of vampires (or zombies like Warm Bodies), Beautiful Creatures centers around an eccentric family of Casters (don’t call them witches) that make quite the impression on high school senior Ethan Wate (Ehrenreich who could be a cousin of Leonardo DiCaprio) as he befriends and then falls for burgeoning caster Lena Duchannes (Englert, daughter of director Jane Campion) . Yearning to get out of his backwater bayou town, Wate is infatuated with the mysterious Lena and it isn’t long before the two are quite smitten with each other…though Lena is at first resistant. You see, she’s right on the edge of coming of age in the world of Casters…and she just might end up on the dark side of things like her cousin Ridley (Rossum). Only Lena’s uncle (Irons) and Ethan’s housekeeper (Davis) know what true dangers lay in store for Ethan and Lena should their love be allowed to develop naturally. There’s quite a bit of information that the movie has to cram in and though I haven’t read the books I’ve heard that director and screenwriter LaGravenese did good work in streamlining by combining characters and leaving some out entirely. That’s always a risky move for the first film in a series (there are four books) because if you alienate the base fans you may lose them for the sequels. 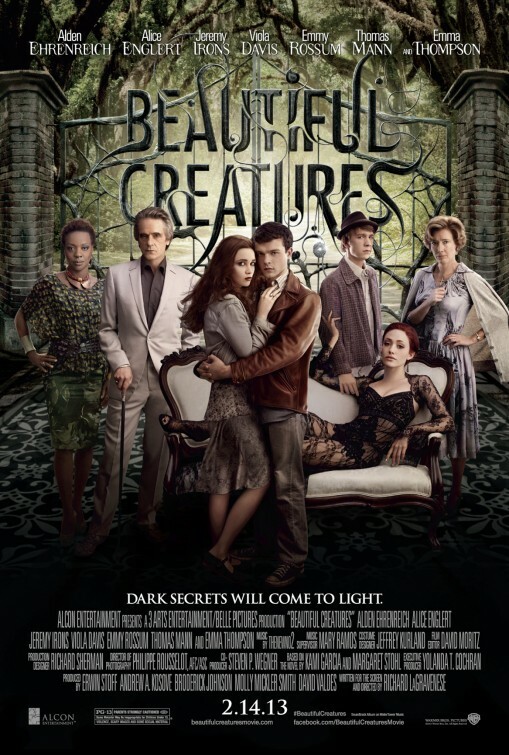 Admittedly, Beautiful Creatures does feel like an introductory film rather than one ready to tell its own story. There are a few characters introduced that I can tell will come back in later books with more of a purpose but are only on screen as a placeholder face for future installments. Where the film really succeeds is in the casting. Ehrenreich and Englert are both interesting actors that don’t push things too far. Ehrenreich, in particular, is a winningly normal kid with charm to spare. That the two don’t have fiery chemistry is a bit of a disappointment — because the end result feels like you’re watching the awkwardness of two life-long friends that only recently started dating. Irons, Davis, and Rossum invest themselves just enough to add some spark to their scenes. The film is really worth seeing for Thompson’s performance alone. It’s pretty clear Thompson is having a grand old time and she lays the Southern drawl and mannerisms on thick. She’s a refreshing hoot and owns every scene she’s a part of. Whether you think of it as Twilight in the Garden of Good and Evil or Twilight on the Bayou, this is one you may wind up liking more than you thought you would. Even with some head-scratching plot holes and a curious lack of serious chemistry between the two leads, the film provided a modest dose of southern comfort that goes down easy. I know that you said you hadn’t read the book, which I respect that…but if you are going to critique the fact “That the two don’t have fiery chemistry is a bit of a disappointment — because the end result feels like you’re watching the awkwardness of two life-long friends that only recently started dating.” Then maybe you should actually consider reading it…because that is EXACTLY, to the T how Stohl and Garcia wrote them to be..that’s the feel you get from them in the book as well, this wasn’t supposed to be some Twilight remake, it’s just a fantasy love triangle. If you take a step back and look at fantasy as a hole, it isn’t Stephanie Myers who came up with this Himan/Mythological creature romance, it goes back much farther than that, farther than Anne Rice and Blood and chocolate even.